I suppose it’s entirely possible that I am of the last generation to learn this little gem from 1760. Whenever I hear the word porridge, this little ditty goes through my head. The really interesting part is that pease porridge bears nearly zero resemblance to what most of us think of as porridge these days. Pease porridge is, if I may draw an ill fitting comparison for the purposes of illustration, much more like hummus than like porridge. As I understand it, pease porridge was legumes cooked, mushed and flavored (onions, olive oil, maybe meat if it was available). When we talk about porridge today, what most people mean is a grain cooked in liquid until the two do some magic to make a soft warm bowl that is neither liquid nor entirely solid. Deeply satisfying, warming, wholesome and hearty. As you likely already know, the Sis sisters are huge fans of porridge in its traditional Western breakfast form – a little sweetness added to cooked grains. We’ve already shared pumpkin apple steel cut oats, chocolate oatmeal, and quinoa porridge, to name just a few. Apparently the Scottish are the kings and queens of porridge, and porridge has starred in a number of culinary competitions, including the recent London Porridge Championships, not to be confused with the World Porridge Making Championships… who knew? All this attention being paid to the production of and the adornment of porridge makes those packets of precut, highly sugared, not really that much more convenient than the real thing oatmeal seem a little, well, lame (more thoughts on reasons to ditch “instant” oatmeal here). Aside from bolstering my own love affair with oatmeal, this story of the London Porridge Championships reminded me of a historical culinary truth that I keep forgetting before I can implement it in my own kitchen. Porridge can be savory. Oh yes, and it’s not just for breakfast anymore, in fact it never was. Old cookbooks are full of recipes for savory cooked grains for lunch and dinner. We eat a lot of rice around here, and frankly a savory porridge might be just the thing our varia bowls need every now and again. And so I decided it was time for a savory porridge experiment… but how to approach it to best hedge my bets with Ms. Picky Pants? I settled on polenta . I didn’t want to potentially diminish the power of oatmeal in the morning here by having an oatmeal fail. Polenta’s creaminess and corniness seemed promising for my corny crowd. Mediterranean flavors tend to fare well… seemed like a good bet all around. And so, while not perhaps a traditional Scottish porridge, a grain cooked in liquid to creamy perfection is indeed what polenta is. Topped with white beans and kale? Oh yes, please. I made this delightful dish from Patrice at Circle B Kitchen. I followed the recipe pretty closely (I AM capable, just usually not willing) except that I cut the animal products out of the polenta by replacing the liquids for cooking the polenta with 3 cups of veggie broth and 1 c coconut milk. I also ditched the cheese in favor of a smaller amount of nutritional yeast. Butter gone, olive oil in. Done. Vegan polenta. Admittedly less creamy in fat feel, but still super creamily delish. And the perfect base for white beans with kale. Thanks Patrice, for a lovely dinner and a baby step down the road to porridge for dinner. Good Grief! I decided to pile these together so I wouldn’t clog up your feed. For the kale: listeria, Seattle area Whole Foods. If you’re near there, I’d check it out. For the spinach: salmonella, Canadian stores (Ontario, Quebec and “other areas”). Details. 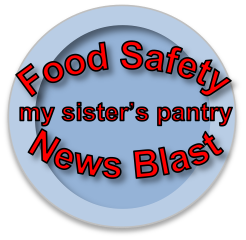 For deli salads: listeria, Weis supermarkets. More info here. All of this makes me extra happy to see news like this. Kudos to Wegman’s for raising standards. Here’s hoping other chains follow suit. Eat well, be well friends. It is oh so easy, when talking about how to improve our diets, to get stuck in the language of deprivation. Don’t Eat This, Don’t Eat That, Cut That, Avoid This, This Will Make You Sick, This Will Make You Bloated, Stop Eating What You’re Eating, Don’t Eat What You’re Thinking, You Shouldn’t, You Mustn’t, Don’t, Don’t Don’t EAT!!!! I realize I may be the only one who occasionally still veers adolescent n my behavior and reactions but there’s only so much mustn’t I can take. It is critically important when attempting to improve your eating habits to put more than a little of that mental energy into thinking about what you SHOULD eat rather than what you SHOULDN’T eat. Focusing on the should and the can and the new and different and the experiments and the flavors is a framework of abundance and permission and excitement. You are not a child; don’t spend all day scolding yourself. Spend some time telling yourself what you can or even should do and then play with that suggestion. There is a fine line between preparedness and panic and while I’ve not yet swung into panic, I confess that weather events get me a little looney. The unpredictability, the noise, the fact that I’m responsible for small people and a VERY neurotic dog… I’m not a good storm buddy. If you live in the U.S. and don’t have your head planted firmly under a rock, you’ve likely heard that the East Coast (coast being used VERY broadly here) is taking a beating, and we are about 36 hours out from the most intense part of the storm. I’ve tried not to act as though there the ZombiePocalypse is imminent; however, I did see some wisdom in loading up on lighting devices, getting some bottled water, some food items that will be easily dealt with in low power situations, and a few craft items for the kids to interrupt anxiety. I’ve also made an effort to eat up items that would be unlikely to make it through a power outage of any duration. THIS is how I come up with a recipe friends. I’m not proud, but near panic and a desire not to waste food can really get me moving in the kitchen. 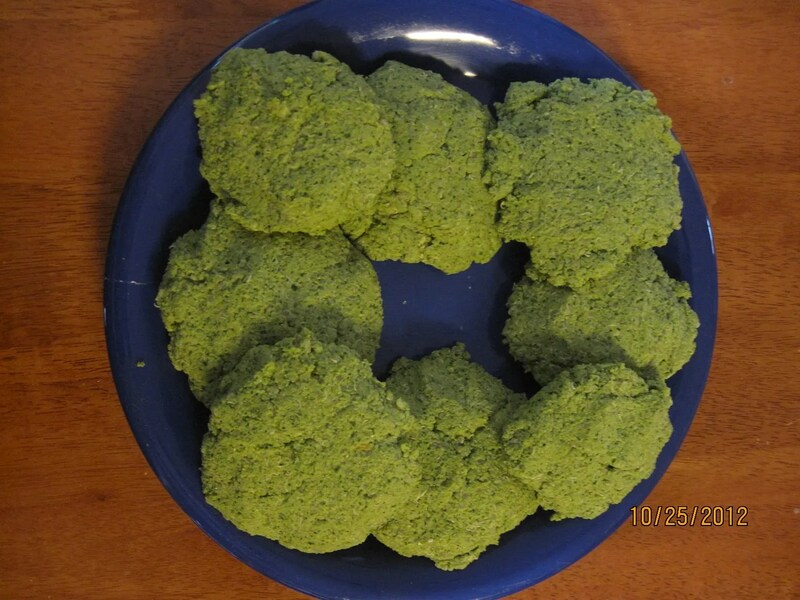 So, I’ve pulled together a strange assortment of items to make fabulously green patties (just in time for Halloween :-)) that we ate like burgers, but that if I made again I would likely serve more like falafel – smaller patties rather than one large one. Perhaps like my daughter, I admit to a certain appreciation for small food. Given the landscape of my fridge, I must concede that this is a strange assembly of ingredients, but I’ll give some suggestions for replacements if you’d like some good green eating for the monsters in your tribe and don’t have the same sampling currently available. Preheat oven to 325. In pan on stove, warm pan with a splash of olive oil. Add onions and cook on low-medium until onions are soft. Add garlic and cook until you can smell it (about 30 seconds). 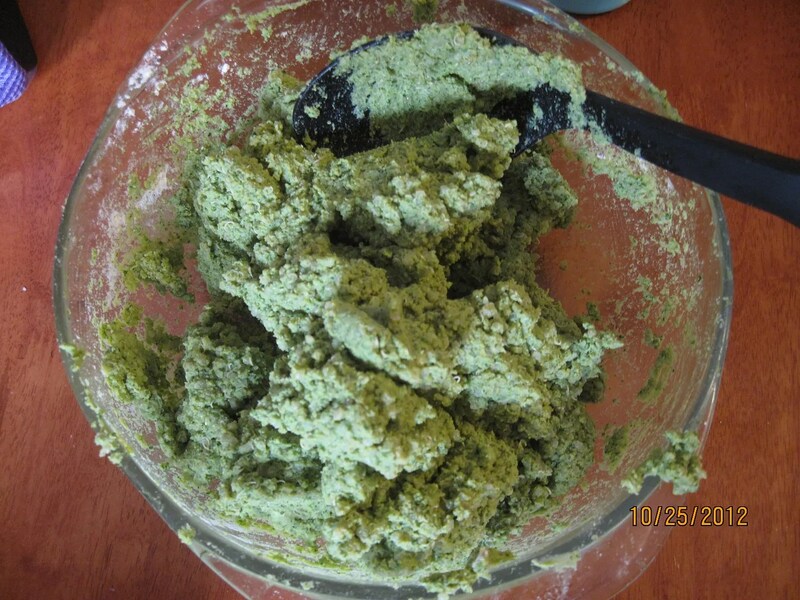 Put contents of pan and ingredients up until the garbanzo flour into a food processor. You may need to add the kale a little at a time. Add the flour a bit at a time until the mixture is wet, but will hold shape. In a bowl, add the quinoa and stir to distribute. Form dough into patties. If the mixture is too wet, add bit more flour. Add olive oil to pan and warm over medium heat. 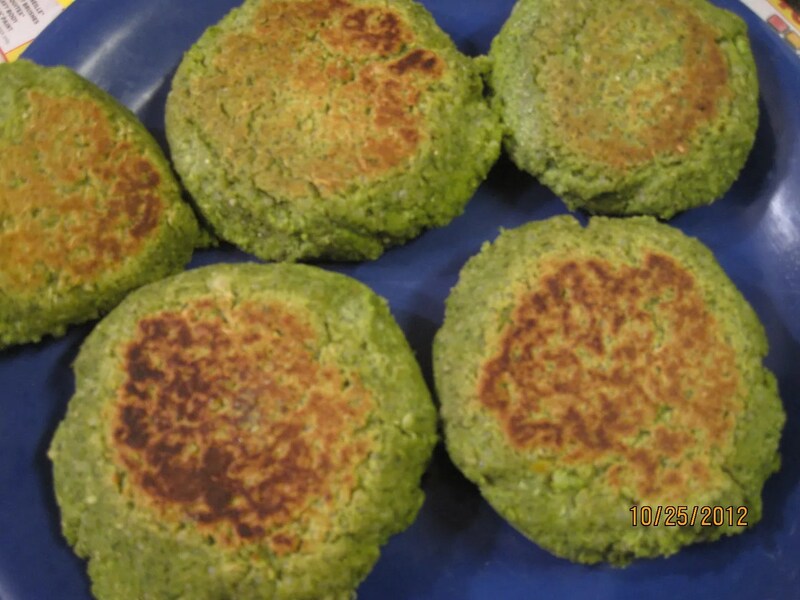 Cook patties about 6-8 minutes per side and then move to oven for about 10 minutes to cook through. There you go. A perfectly spooky green dinner, delicious with burger fixings, or as I had mine, with a nice big dollop of smoky baba ghanoush. Delish. Big Sis and I (and our respective spouses and offspring) descended on our parents yesterday, having previously hatched up (har, har) a plan to dye Easter eggs as a group. Having discovered that Paas (and everybody else) includes food colorings that we find objectionable for contact with food, we decided to try some natural dyes. We also decided(some wisdom here) to bring crayons and stickers in the event that things didn’t go according to plan… We tried several recommended options, including beets, turmeric, paprika, spinach, green tea, something else I can’t remember (“brown”), and blueberry. Remember how I said I don’t always follow ALL of the directions? Well, apparently if I’d read ALL of them (or more than one post about them), I’d have discovered that MOST natural dyes perform best when you boil the eggs WITH the food. Oh… Blueberry, apparently, is an exception to this rule. 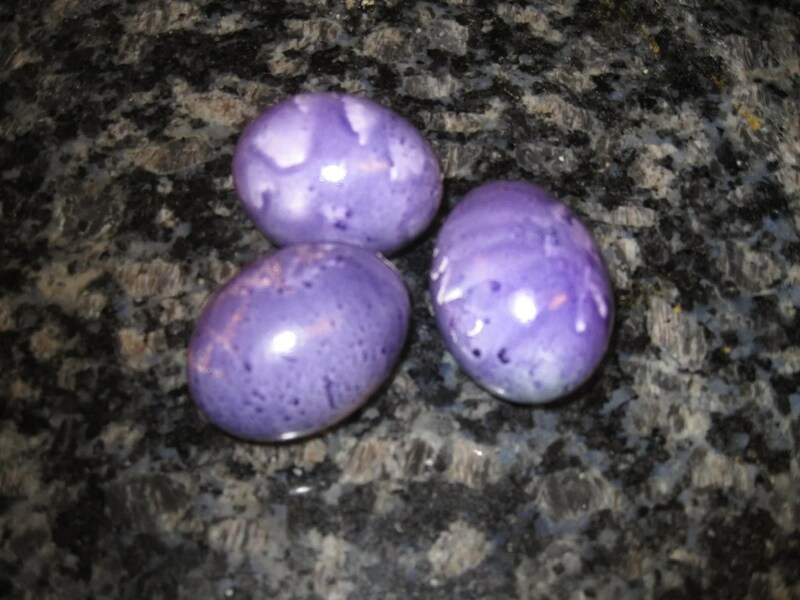 So we had a wonderful time coloring, stickering, and dying fabulously purple eggs. I’ve been dreading this day a bit, because of the whole sugar extravaganza. We had a lovely dinner with my parents last night that included delicious deserts that all four of us consumed with great vigor. It’s possible that I overdid it… And so when I woke up this morning, the last thing I wanted was to eat candy, to see candy, to provide my children with candy, or to argue about candy. 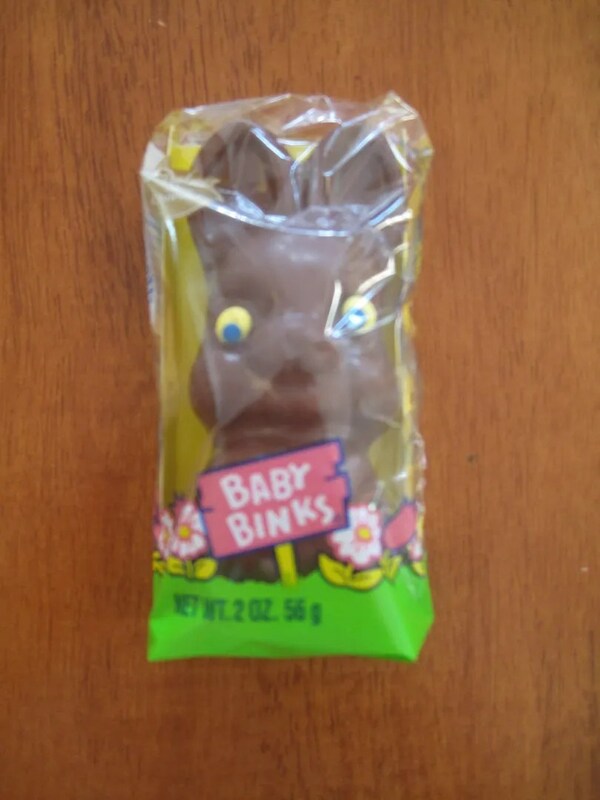 I did give them a little in their Easter baskets, but none of the consequences that I feared came to pass. It was absolutely no surprise to them that they would have to wait until after breakfast to have any. It was no surprise after breakfast that they would be limited to one small item. They have asked a couple of more times and we’ve let them work through a few Jordan almonds, but there has been no drama, no whining or complaining, and the sugar amounts have been small enough that there’s not even been an obvious sugar freakout. I am so delighted that I can provide them with a “treat” and have it incorporated into our family’s rules about food so seamlessly. I guess all of the earlier conversations are paying off. Hallelujah indeed. So I mentioned that I overindulged a bit yesterday and as happens during holiday weekends, I felt a bit done with the food celebration before we got to the actual event. 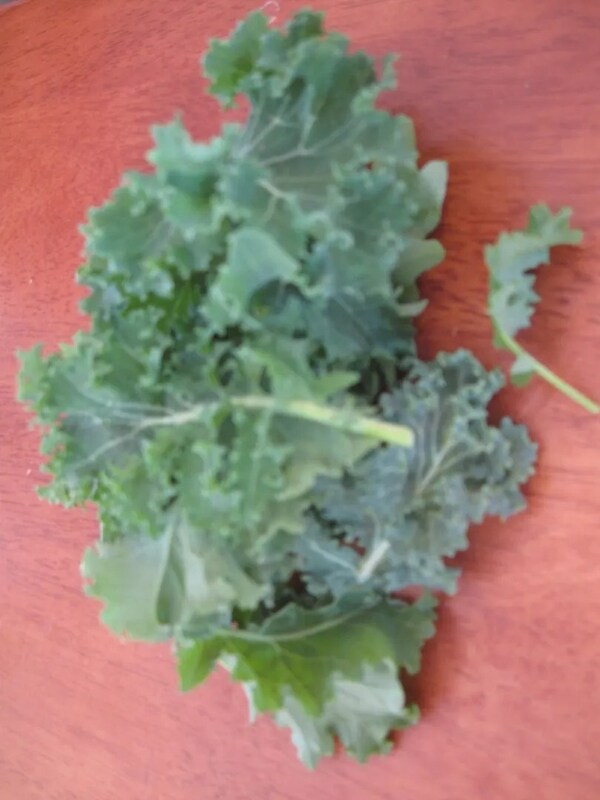 So this morning after the children found all of their bits, I went out to the kale patch and harvested the last of what last season’s still living plants had to offer. Stuffed it into a blender with a whole bunch of other bits and served it with the hard boiled eggs that tradition commanded and some toast. I had a small amount of the egg salad (because my husband makes KILLER egg salad), but drank down a huge glass of that kale smoothie, and my oh my but I felt better after that. The “recipe” below is fairly approximate as in my haste to complete the task before the wheels came off the children’s respective carts, I got a little loosy-goosey with the measuring. Adjust to your and your own crew’s preferences. Place the chia seeds in a bowl or glass with 1.5c water and set aside. Place all other indredients in blender. You may have more luck adding the items as you blend, depending on your blender. When you’ve finished assembling other ingredients, check chia seeds. They should seem a little jelly-like; if it’s not, give it a few more minutes. Blend like mad and adjust ingredients to your preferences. My crew LOVED this one. I’m pretty sure we were close to the 3 cups of kale and the cherries added enough sweet and color to keep that reality from my children altogether. This made EXTREMELY generous portions for four very willing consumers. Delish. There you have it folks, Easter traditions done (our way), important lessons learned, and glorious weather enjoyed with family members who are also great friends. Perfect. * A Note About Chia Seeds. Yes, these are THE chia seeds. If you don’t know what I’m talking about you may well have been born sometime after the 1980’s; the rest of us are busy hearing a jingle in our heads. “Ch,ch,ch chia pet.” Yes. Same chia. The seeds are highly nutritious and can add body to other foods if mixed with liquid and allowed to sit. I’ve used them here to increase the nutritional punch and to give the smoothie more, well, smoothie feeling, thickness, without resorting to either adding protein powder or using so much frozen fruit that my Vitamix gets ticked off at me. I get mine in bulk at my local food co-op and I have also seen them in my local Wegman’s. There is nothing like a smoothie…. nothing in the world. There is nothing you can loothie…groovy… movie…. never mind. I love smoothies, but my boys (young and old), at some point politely requested that smoothies not be green but be pretty colors from things like strawberries, blueberries and pineapple. Tear kale leaves off of stems and tear into small shapes. Put berries, kale, 1/2 banana, and water into a blender and blend until smooth. Enjoy! The first time I doubled the recipe – and I probably packed the kale down a little harder than was the intention – as I am at times an overachiever. I used only blueberries as that is what I had. The boys stated, “Pretty good. You can still taste the kale, but it’s okay.” They drank it. Gardening is work. There is no denying that. It does however, in my humble opinion, beat the HELL out of cleaning bathrooms. I much prefer the smell of soil and the smell of the different plants and leaves to the smell of bad male aim, if you take my meaning. When we lived in the country, I did solve bathroom problems and garden problems by having my husband pee around the perimeter of the gardens at night. This is very effective rabbit repellent and probably provides some nitrogen to the soil as well! At any rate… back to gardening as work. What an utter joy to come out to find little gems in the early spring garden that are leftover from last year! We did have a mild winter (even for us) here in middle TN and I have 2 bunches of swiss chard that are growing – one green and one red. I also cut back some kale that was still growing about 2 weeks ago and I’ll be able to harvest a stir fry or kale chips recipe in a few days. And last but not least, leeks! Lovely, luscious, expensive leeks are growing in my garden! I tried to start them from seed in the garden in several spots last summer and got nothing. Not a peep! But – one row that I planted in the fall started to come up just as it was getting cold and I thought they’d freeze. Well those hardy onion cousins are standing straight and about 8″ tall. Can’t wait to sautee, stir fry and make the crunchy leeks litlsis has been raving about. Joy!